This is FOX Rehabilitation’s mission in a nutshell. “We have to eradicate ageism from our own profession. We can’t under challenge people.” says Dr. Will Dieter, PT, DPT, GCS, FSOAE, and FOX’s Director of Physical Therapy Clinical Services and the FOX Geriatric Residency in Physical Therapy. 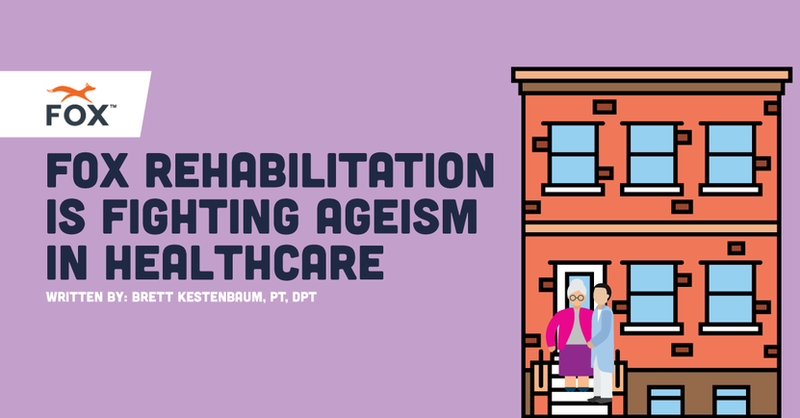 To this end, FOX is harnessing all the clinical evidence—and there is a lot—available in geriatric PT to make their innovative practice model as successful as possible. “When I think about this organization, and how we view the older adult client, it’s objective,” Dr. King argues. “It’s based on that client—not their age, their clinical presentation.” Rather than assuming that a client can only stand a certain intensity level because they’re 70 years old, or 90 years old, FOX clinicians assess each client’s clinical presentation and assign high intensity treatment plans—because that’s what the literature supports. It’s been observed that only 14% of the clinical evidence actually makes it to practice, and it takes 17 years for the evidence to do so. This timeline, for FOX clinicians, is far too slow to be in patients’ best interests, and so FOX mobilizes its resources to get that evidence into the hands of its clinicians as quickly and effectively as possible, and to provide them what they need to put it immediately into practice. “The mission and the focus is on clinical care, optimizing people’s ability, helping them achieve what they once thought impossible—and I think it all boils down to this practice not accepting ageism,” says Dr. Dieter. Check out new FOX Rehabilitation jobs below!